No game on my iPhone engaged me as long or as deeply as the original Plants Vs Zombies. 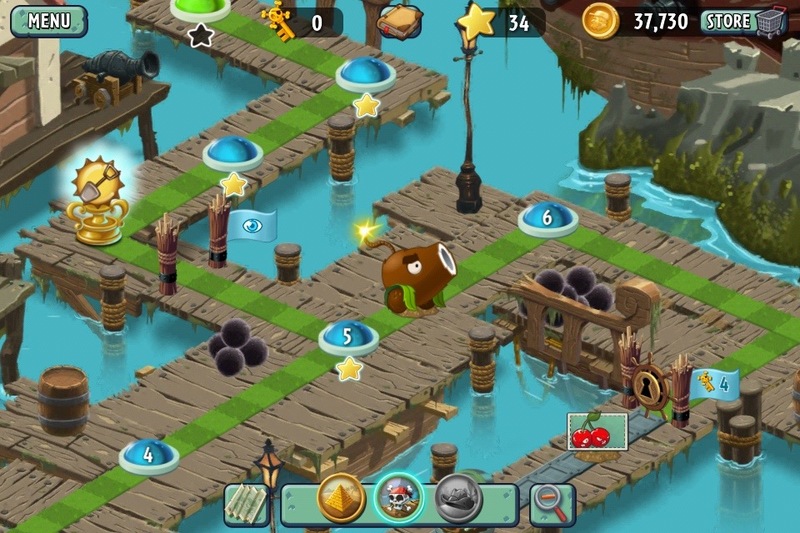 A tower-defence game blessed with an abundance of humour, impressive cartoon visuals and a catchy score (including the best end credits song since Portal), it also had the benefit of a developer that continued to enhance and upgrade the game for several years after it came out, with new game modes and other add-ons. Well, the sequel has finally landed, in the form of Plants Vs Zombies 2: It’s About Time, a punning, double-meaning subtitle that reassures fans of the original that the same twisted brains are still in charge. The big change this time around is that PvZ2 is free-to-play. The game itself comes without charge, but players can decided to pay more for extras within the game itself. Free-to-play is rightly viewed with some suspicion. It’s a new business model for the games industry, and earlier efforts to make it work have resulted in crippled games that frustrate players. Luckily, PvZ2 takes another tack: the game offers an abundance of content, all of which can be accessed for free, but players can spend some coin to make their passage through the game easier or to buy some new plants to improve the variety of the experience. As far as gameplay goes, the winning formula hasn’t been altered: the player places plants on the left of the screen and zombies attack from the right in waves of increasing intensity. There are some new elements thrown in, such as new plants and new zombies, but if anything the variety is a little bit down compared to the state the first game reached with all its expansions in place. Tweaks have been added to the gameplay in the form of new special powers. Plant food supercharges plants temporarily and coins can be spent to activate special powers that will squish, electrocute or fling zombies offscreen. For an old-school player, these powers can seem a little like cheating, but the game is balanced so that while plant food is often necessary, the special powers rarely are. However, the in-battle currencies of plant food and coins do add complexity to a game laden with currencies (the familiar sun for buying new plants, stars for completing new levels and keys to unlock new routes). These routes are the big change in the presentation of the game world. The first game took place in a back yard, by day and night, with a pool and without, and occasionally afflicted by fog. The player progressed from level to level, in a linear fashion. In PvZ2, the game is split into three worlds (Ancient Egypt, Pirates and Wild West, with an upcoming Far Future world having been announced). Each one is completed by following a linear path, but keys gained during battles allow the player to unlock side paths and gain extra plants and abilities thereby. It’s a slightly more graphically intense game than the old one (only iPhone 4 and above need apply), and the graphics designed for retina displays take a little adjusting to, but everything is in order gameplay-wise. It’s as addictive as the old game—I’ve already completed the first world and made my way through part of the second, at a time when I really shouldn’t be playing games (or writing reviews of them). The one niggle I’d point out? Although the side routes in each game world do offer different challenges akin to the mini-games of the first game, there’s no way to tell which one is which from the isometric world map. It’s a bit of an odd design decision, and one that I suspect will be fixed in further updates. If nothing else, Popcap’s reputation breeds confidence in the fact that this will be a well-supported game for a long time to come. Recommending this game is a no-brainer (ahem). For no money at all, you get the same great gameplay of the original PvZ, and you can happily play through it without spending a penny. My only worry is that a lot of people will do just that, and that PvZ2 won’t be the financial success it deserves to be. Because, honestly, we could all do with more games like this.